Iran owns a lot of tangible and intangible heritage remains of the ancient civilizations. Out of these many attractions 21 unique sites have been registered under the name of Iran until July 2016. Being in UNESCO list means a lot to a nation, since it promotes the heritage values and ensure its preservation for generations. The collection of 11 Qanats each one with specific characteristic and Lut desert, Iran’s first natural site were added a few days ago. In honor of this registration and beyond that try to bring forward more heritage sites to the world, Iran tour center organized two specific tour packages consist of almost all Iran UNESCO sites. This adventurous trip to Iran is perfect for families and those with cultural interests and also it could be a charming setting for photography in Iran. Full day city tour of Tehran to visit Golestan Palace the Unesco heritage site. The oldest historic monuments in Tehran which is consists of 17 palaces, museums, and Halls and originally built during the Safavid dynasty. Then visiting The Archaeological or national museum which is the combination of two museums, the old Archaeological Museum of Iran and the modernistic white travertine National Arts Museum with eight departments and finally Glass and Carpet Museums. Overnight Tehran. Drive to Alamut visiting Avan lake en-route. Spend the day at the mountain and enjoy the wonderful nature then Visiting the Alamut castle. Overnight Alamut. Drive to Ardebil via Asalem road and enjoying the fantastic road, enroute a short stop in Anzali to visit its beautiful lagoon. Visit the historical city of Ardebil that is believed to be as old as the Achaemenid (ca. 550–330 BC). Its name comes from the Zoroastrian name of “Artawila”, which means a holy place. City tour will be started by visiting The complex of Sheikh Safi-ad-din Ardabili that comprising the mausoleums of Sheikh Safi, its dome called “Allah-Allah, Shah Ismail I, the house of chinaware (Chini khaneh), a mosque, Jannat Sara (meaning the house of paradise), the house of Dervishes (Khanaqah), the house of lamps (Cheragh Khaneh), Shahid khaneh (the house of martyrs) and Chelleh Khaneh (based on time). Overnight There. Drive to Tabriz via the city of hot springs. It has a charming climate that every year attracts many passengers. Its name is Sarein and means “Spring’s Outlet”. Going on a city tour of Tabriz to visit Blue Mosque, Azerbaijan Museum, Golestan Park, Saat Tower and Arg and the spectacular Bazaar of Tabriz that is one of the oldest bazaars of the Middle East and the largest covered bazaar in the World. It comprises of several sub-bazaars, such as Amir Bazaar for gold and jewelry, Mozzafarieh in which you can find the most beautiful and luxurious carpets in Iran and even world, a shoe bazaar, and many other ones for various goods ; El Goli park will be the last attraction. Overnight Tabriz. Early in the morning travel north to visit St. Stepanus church at Jolfa county. A beautiful Armenian church which is nested in a deep valley near the river Aras. Then The Iranian church, ZdorZdor (zorzor) .This monument made by saint Thaddeus in the 14th century and finally St. Thaddaeus church, known also as the Black Church (Ghara Kelisa). All of them are Unesco world heritage sites. Overnight Maku. Drive to Orumiyeh, half day city tour to visit Bazaar, church and etc. Overnight Orumiyeh. Drive in the morning to Takab to visit Takht-e Soleyman, another Unesco world heritage site with important symbolic significance. It includes the remains of a Zoroastrian fire temple built during the Sassanid period and partially rebuilt during the Ilkhanid period as well as a temple of the Sassanian period (6th and 7th centuries) dedicated to Anahita. Overnight Takab. Another day in tour will be started by moving to Zanjan. Half day city tour of Zanjan to visit Rakhtshooy Khaneh Edifice .It is a traditional laundry house that belongs to Qajar era, then Salt men Museum and Bazaar. Overnight Zanjan. Dive in the morning to Tehran, enroute visiting the mausoleum of Oljaytu which was constructed in 1302–12 in the city of Soltaniyeh, the capital of the Ilkhanid dynasty. 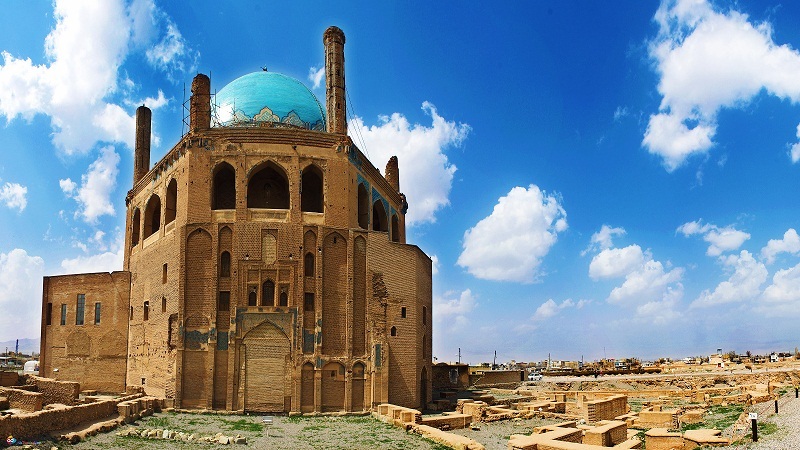 Soltaniyeh Dome is octagonal building is crowned with a 50 m tall dome covered in turquoise-blue faience and surrounded by eight slender minarets. It is the earliest existing example of the double-shelled dome in Iran. After that going to visit the dragon temple near Soltaniyeh. Two figures of dragon are carved on two opposite walls of the temple. This temple is a beautiful heritage of antecedents of Viyar village. Then transfer to international airport for departure flight.